Charlie:"2319! We have a 2319!" Abominable Snowman:"It ain't easy being banished. Take my buddy Bigfoot. When he was banished he fashioned an enormous diaper out of poison ivy. Wore it on his head like a tiara. Called himself 'King Itchy'." Randall:"Do you hear that? It's the winds of change." Mike Wazowski:"I'm on the cover of a magazine!" Mr. Waternoose:"There's nothing more toxic or deadly than a human child. A single touch could kill you!" Mike Wazowski:"Hey, good evening! How are you? Nice to see you! I tell ya, it's great to be here in your room. Where you from? Never mind. You're in kindergarten right? Boy I loved kindergarten. Best three years of my life! Of my life! But I love sports. Dodge ball was the best! Oh yeah. I was the fastest one out there. Of course I was the ball. I was the ball, see?" Mike Wazowski:"One of these days I am really going to let you teach that guy a lesson." Mike Wazowski:"I love you smoochy poo!" Mike Wazowski:"Hey, less talk, more pain marshmallow boy!" Mr. Waternoose:"Ah James! Is this one yours?" 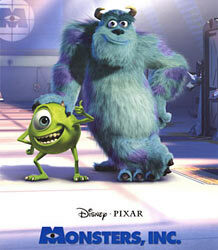 Sulley:"Ah, actually that's my uh, cousin's sister's daughter, sir." Mike Wazowski:"Yeah, it's uh, 'Bring an Obscure Relative to Work Day'." Mike Wazowski:"Hey, can I borrow your odorant?" Sulley:"Yeah, I got Smelly Garbage or Old Dumpster." Mike Wazowski:"You got Low Tide?" Mike Wazowski:"How about Wet Dog?" Mike Wazowski:"You know, only somebody with perfect comedic timing could produce this much energy in one shot." Mike Wazowski:"I don't know what it's been said, I love scaring kids in bed!" Roz:"Your stunned silence is very reassuring." Abominable Snowman:"Abominable. Can you believe that? Do I look abominable to you? Why can't they call me the Adorable Snowman, or the Agreeable Snowman, for crying out loud? I'm a nice guy." Mike Wazowski:"Hey thanks a lot! I'll be here all week! Remember to tip your waitresses!" Mike Wazowski:"That is the weirdest thing you have ever said." Abominable Snowman:"Welcome to the Himalayas!" Mike Wazowski:"Hey, good morning, Monstropolis. It's now five after the hour of 6:00 A.M. in the big monster city. Temperature's a balmy 65 degrees, which is good news for you reptiles, and it looks like it's gonna be a perfect day to maybe, hey, just lie in bed, sleep in, or simply work out that flab that's hanging over the bed!"